Throughout history, mankind has recorded observations of the Aura as an energy field surrounding body. Indian spiritual traditions over 5000 years old tell us of a Universal energy, a vital source of all life formed as an individual field which is perceived as a luminous body surrounding & integrated with the physical body of each living & non leaving thing including plants, animals & inanimate objects even like tables bed, stone etc., with the spiritual plane where all energy & creation originate. Only the seers & few clairvoyants were able to read all 49 levels of a person’s Aura. 7 layers per chakra. Our Ancient Hindu Vedic texts & other esoteric teachings have described the electromagnetic fields & subatomic physics seen as Aura as an energy field surrounding the human body. The rig Veda says that the Agni brings all Devas i.e. natural forces into the Yajna. This means that all natural forces like gravitation, electromagnetism, thermal energy etc. come into play at the instance of Agni. The Aggregation of matter in the form of elementary particles & Atoms & their motion produces the vast Yajna in the form of the great creation. The main elementary particles & atoms taking part in the process are Mitra the electron & Varuna the proton and their combination Mitra-Varuna, the hydrogen Atom. The interplay of Electromagnetic & gravitational forces produces thermal energy with the emission of electromagnetic radiation from it. The Rig Veda reveals further that the elementary particles & atoms first come closer on account of electrical attraction & produce thermal energy. Thereafter gravitational forces enhance this process and produce light & electromagnetic radiation. A confirmation of the truth that the main strength of God Vishnu (The preserver & sustainer of the entire universe & mythically the wielder of the Sudarshana Chakra, which symbolizes rotary motion) rotates the energy like a big wheel. By this great strong rotary motion & centrifugal force three kinds of Aura were ejected, [having low, medium and high brightness,] this is the formation of the cosmic electromagnetic Aura our body. In the Kurma Purana it is said that “The rays that compose his body are omnipresent & illumine the limitless worlds in the Universe & they form the matrices of the seven planets”. The rays do the work of creation, maintenance & destruction of the Universe as the Mind wills & as Time is mature. In recent years, more & more people are interested in exploring the human Aura to understand the true source of emotional & physical imbalances which often lead to disease. 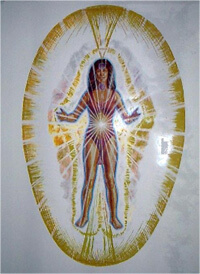 The Aura, a field of energy that surrounds people & other living things, reflects the energy of the spirit in that body. Commonly called the etheric field, this energy extends about two or four inches around the body & usually a light or pastel shade. Layering the etheric is the aura which contains every colour & shade in the rainbow & usually extends 2-5 inches from the body. Its colours textures & patterns reveal much information about emotional, mental physical, spiritual, karmic, environmental & relational states. An Aura is like a thumb print, it is completely individual & express who you really are in our entire splendor. As has been said already we have to look for the origin of everything to the cosmic colours. The punch mahabhutas are the five great elements i.e. Earth, water, fire, Air & Ether are nothing but condensation of green colour. Water is Orange & Indigo. Fire is Red & Yellow, Air of Violet while Ether is the condensed form of Blue. Eyes show Red cosmic colour,Skin shows Violet cosmic colour, Nose Tip shows Green cosmic colour, Tongue shows Orange cosmic colour & Cavities including ears show Blue cosmic colour. Besides the above, body heat is caused by Yellow Indigo maintains body’s cold. Thus the sense organs are related to the seven colours. Likewise five Vayus: Pran, Apan, Saman, Udan & Vyan have their origin in the 7 colours. Pran Vayu originates from the Earth element, and therefore is of cosmic Green colour. Apan Vayu as originates from the water element, and therefore is of Orange & Indigo colour. Saman Vayu as originates from Agni element, hence forms from Yellow & Red. Vyan Vayu as originates from Ether elements hence forms form Blue cosmic colour. The Tridosha of Ayurveda has also its origin in cosmic colours. Vayu Dosha is a combination of Air & Ether elements & it therefore originates from the cosmic colours Blue & Violet. Pita Dosha is due to Fire element; hence it originates from Yellow & Red cosmic colours. Kafa Dosha is a combination of Water & Earth Elements hence originates from Orange-Indigo & Green cosmic colours. Thus it broadly shows the importance of cosmic colours which are enveloped on our body around us called Aura. The rays of Aura play an important part in our lives. We are born in these rays; we live & thrive in these rays. Hence when we talk about Aura we mean the existence. Individuals with very unbalanced emotional lives can mature into emotionally balanced personalities by increasing their awareness & by using appropriate therapies meditation, although this personality change is a process that requires time. While doing Vastu of a house/ business place/ factory, if we generate a strong Aura containing all the seven colours we can get an opportunity to live happily. There is no other better way to experience one’s inner beauty & uniqueness than to see the rainbow of glorious colours that are in one’s Aura and his surroundings. The brilliant colours contained in the Aura vibrate to the purest essence of the essential YOU and you reveal yourself in all your magnificence.